My writer-friend Liz Kellebrew sent me this photo of a coyote traveling on the Portland MAX light rail, taken back in 2002. 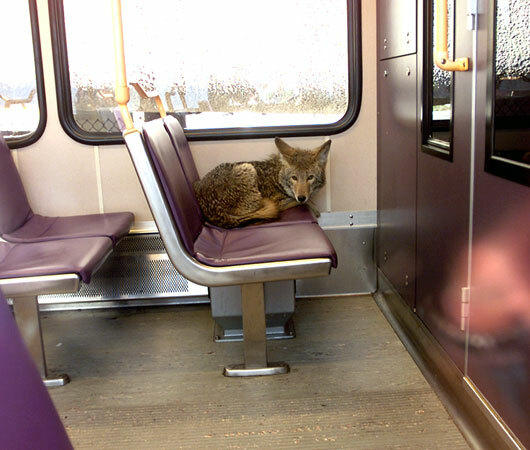 They think this coyote came onto the train with a fare checker, and it (the coyote) was eventually captured by Wildlife Services and released in a more coyote-friendly location. This photo reminded me of one of my favorite poems of all time, Nora Naranjo-Morse’s “A Well-Traveled Coyote” (link below), and it was inspiration for my poem. If you’ve been to Portland (Oregon), you may want to keep an eye out for coyotes in disguise. They’re probably doing research on humans. Reblogged this on Liz Kellebrew. I like your poem. Your coyote travel everywhere. He is sneaky but friendly!! Yes..that poor coyote looked so forlorn, yet right at home. :). Friendly! Please read this nice poem from my friend Teresa Barker. Aw, look at that little thing!! 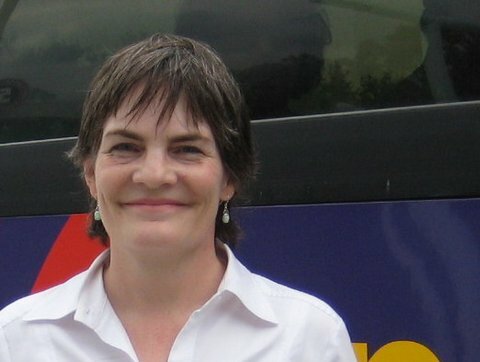 Hi Theresa! All well here! Are you starting any new project like Cinderella? I live near a beautiful urban forest and on my walk today I thought of the coyotes that have crossed my path, how lovely to come across your beautiful poem and that glorious photo! Kimberlee, thank you for letting me know you enjoyed my post. I love that you live near an urban forest! That is wonderful. Such a great resource for our minds and bodies. We need more of them! Looking forward to reading more about your observations on your blog! Thank you so much! I really enjoyed your poem, the words are still running through my mind! Lovely poem, Therese. It speaks of both disguise and blending, and I think no matter how we fit in where we are, we can just never know who is watching us. I smiled when I read the cool line – how we think we are cool when we feel no one is watching us. It is these moments that we feel we can do anything and get away with it. The times that I want to simply blend in are usually early in the morning on the way to work. On the train, I prefer anyone not talk to me or bother me, just want to get to work in peace. This is both cool and profound. You’re such an amazing writer, truly. I love it. I’d like to be the Coyote. 🙂 I do like to watch people. We can gather a lot of material for writing from people-watching.